December's full moon today is called the "Full Cold Moon." 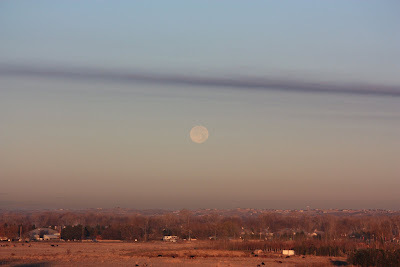 This is the moon on its way to setting into the haze this morning in Boise. Pretty photo! The moon has been awesome the past few nights! We've had cloudy weather and missed the full impact of this beautiful moon. I caught the moon myself yesyerday, yours is spectacular through the haze.